Notions of light and shadow occupy a space within different socio-cultural imaginings and understandings of particular realities – including ideas of knowledge, mortality, morality, power and memory. The human response to light and shadow - both as metaphor and as practice – is intertwined with different perceptions of luminosity (or lack thereof) that reveal and conceal various experiences of the world. This exhibition explores cross-cultural understandings and material expressions to present light and shadow as existing in harmony with one another rather than in opposition. Focusing on the Berndt Museum’s Asian Collection, In Light of Shadows curated by Sarah Ridhuan encourages audiences to question the meaning of light and/or darkness in relation to other cultures and within themselves. 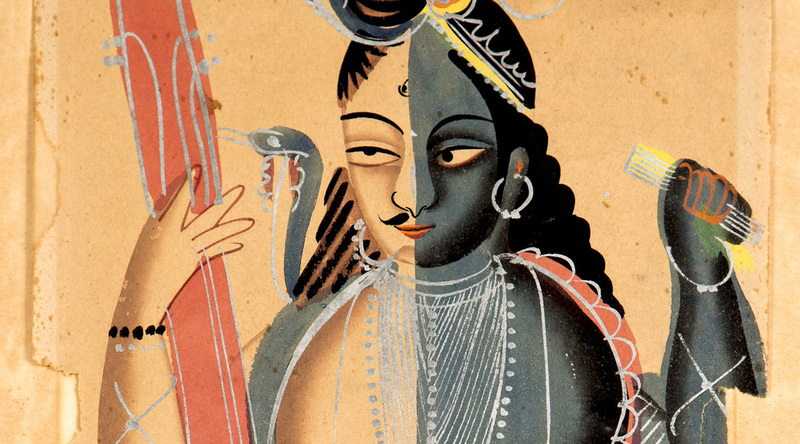 Image: Kalighat, Hari-Hara (detail), 1880-1890, Calcutta, India, watercolour and silver pigment on paper. RM & CH Berndt Estate, Berndt Museum [1963/0055].